For the past two years I have had the opportunity to present live at the Bournemouth Air Festival (BAF), which, as a Television & Broadcasting student from the University of Portsmouth, was a fantastic way to see first-hand how an outside broadcast works...whilst getting paid! I managed to get this experience when, last year, I volunteered at the America's Cup World Series, in Portsmouth. I networked and found myself with contacts for freelance work for two different companies. This led to me freelancing at the Bristol Balloon Fiesta facilitating social media for the event. Whilst I was there I spoke about my presenting experience that we are able to gain skills in through our course, next thing I know they are asking me to present at BAF 2015, pre-recorded. Of course I had to say yes, knowing that it wouldn't be live also calmed my nerves. I was very excited to put myself out there and see what I could make from this opportunity, researching into the event beforehand. It was the first time I had done anything like this and was very apprehensive to see what would happen, but when I arrived and met my camera operator I soon seemed to relax as everyone was very supportive. We were using presenter talk back to communicate with the studio as I was off up and down sunny Bournemouth beach (until the rain kicked in), finding out I was now going to be live. The first time I was live was very exhilarating, I was speaking to the two other presenters who were at different locations opening the BAF festival TV, I was able to hear them over the talkback, until we started experiencing 'technical problems'. After the first live part was complete any nerves had vanished and it was time to begin interviewing people. Through my course only interviewing live a few times, I made sure I took a sharpie and my cue cards. I also spoke to the other presenters beforehand about their experience with presenting and they offer me lots of advice. Over the few days I was there in 2015 I interviewed people from the Royal Navy, Royal Marines, Royal Air Force and Armed Forces. I really enjoyed interviewing these people and was able to have a look in some of the tanks and went into one of the Gazelle helicopters (stationary of course). 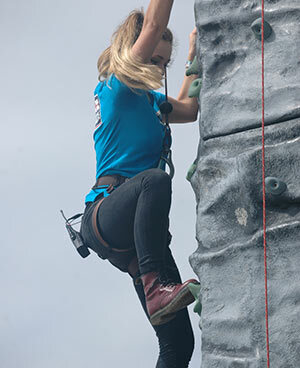 I also offered a very Bridget Jones moment to the public when I was live being timed getting to the top of a rock climbing wall to jump down and fall at the bottom - then to finish the interview, I must say there were some laughs from the kids watching! Aside from all the fun had, when I was invited back this year the importance of networking lingered in my mind. Not only because of the networking was I looking forward to presenting at BAF 2016, but because it was a chance for me to work on an outside broadcast, just before returning to third year (where we have an outside broadcast unit). This was also good because I had been on an industry placement for a year, so it meant I could refresh all my skills and get back into the production way of thinking. Working at BAF 2016 was a very similar yet different experience, but in the best way. I came back knowing what to expect and having another years worth of confidence in public speaking, really helped. I worked at BAF this year for the 4 days which meant I was able to conduct lots more interviews including members of the public, ABF The Soldiers Charity and Royal Navy Royal Marines Charity. Then I finished off the weekend by interviewing three World War 2 veterans, who fought in the Battle of Britain, which was a massive honour. Working with two different presenters, with different advice this year was a good change, both giving me really positive comments and provided me with contacts for further freelance work in TV. Now that I am back at University I can really see how putting theory into practice is key. It is very different working outside of your course and the safety of your University, but it is so important to do so. When working freelance you learn so much just from watching people in the crew and in the studio and you see learning hands on. I would really advise all students looking for work in the TV to gain experience working away from your course. I learned a vast amount from working BAF the past two years.